Hi ladies! 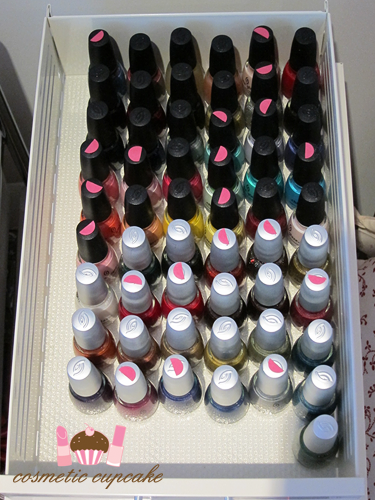 I thought I would show you my updated nail polish storage today. I really need another Helmer but I'm holding off because it will only encourage me to buy more polish which is NOT good! 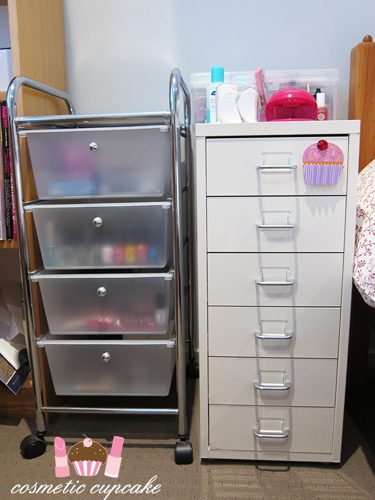 I've acquired a lot more stuff since I last showed you my nail polish storage (you can see my posts from August and October and last year) and I also have a cheaper option to the Helmer too which I've had to add to my storage to hold nail stuff! I love seeing stash pics so I included pics of my polishes ;) WARNING - this post is a bit pic heavy! YES my Helmer is next to my bed. 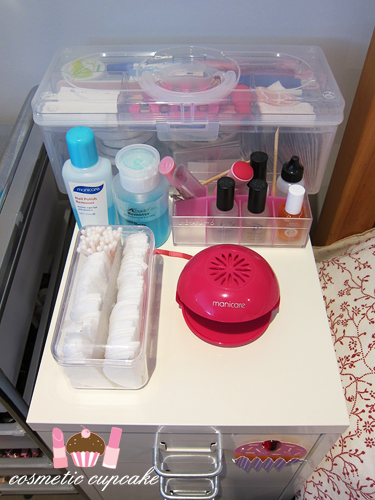 On top of my Helmer I keep my nail art toolbox, manicure essentials, nail dryer and nail polish remover and cotton pads so they're handy. Keeping everything in close reach is important when doing your nails I think - that way you won't wreck your nails looking for stuff! Below are my trusty manicure essentials that I use for every manicure. I love my hot pink Manicare nail dryer which is a must for me! The container is actually a lipstick holder which I got from a dollar store and holds my essentials perfectly. 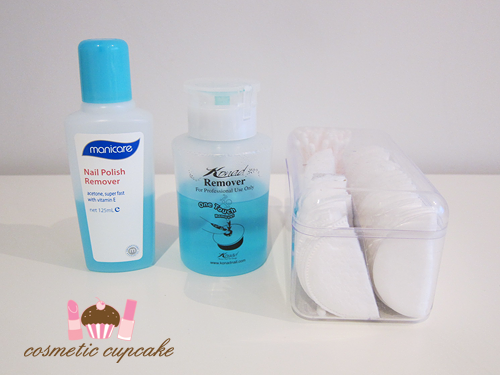 I use the blue Manicare nail polish remover with vitamin E to remove my polish. I use the Konad One Touch Remover for konading. I'm a cheapie so I just recycled an old Ferrero Rocher plastic box to hold my cotton pads =p Works well and didn't cost me anything! 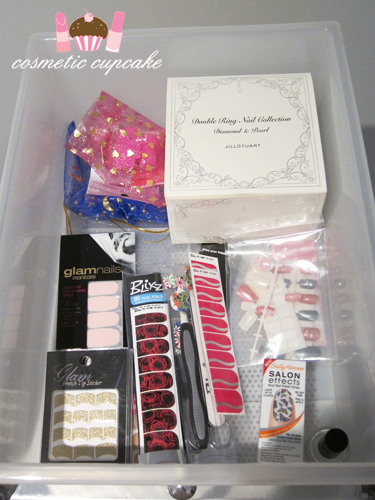 I can't believe at one point all my nail art stuff fit in the toolbox below! Gosh that was a long time ago lol. I got this great toolbox from Riot Art and Craft for $19.99 and it's perfect for holding nail art stuff. 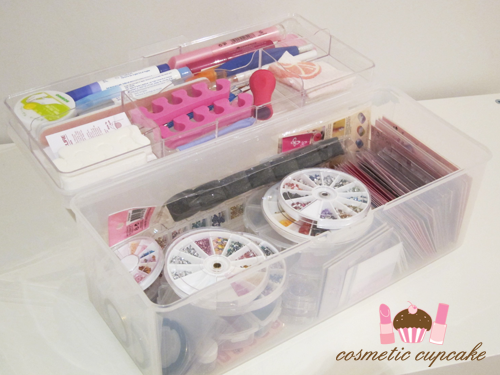 It holds all my rhinestone wheels, cut fimo pieces, nail stickers and other bits and bobs. It's a great toolbox because the bottom is tall enough to store nail polishes so it's great to take on the go too. I like to sort my nail polishes by family (brand) but here and there it's mixed up which kinda annoys me haha. I'm very OCD =p If you're wondering, the red stickers on some of the bottles you see below is my attempt to keep track of what I've used and what I haven't but I gave up after a while. 2nd drawer is all China Glaze which is clearly my favourite brand!! I have lots of nail bits and pieces that I needed to store somewhere as all over my room just wasn't cutting it anymore. 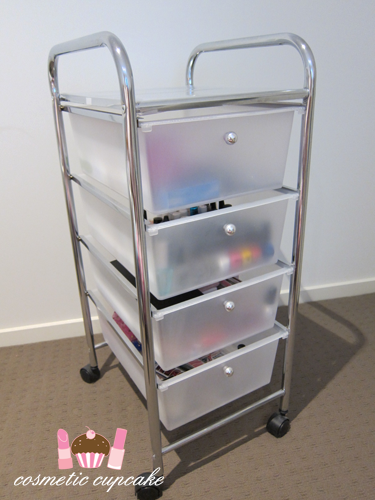 I bought this Homemaker 4 tier chrome drawer trolley for $39 from Kmart ages ago to store skincare stuff but when I moved back home I didn't need it anymore so I decided to use it to store my nail paraphernalia. It would also be good to store nail polishes as it's much cheaper than a Helmer and would hold a considerable amount of polishes too. Obviously it's nowhere near as sturdy as a Helmer but the drawers are deep and if you don't have toooo many polishes it would be something to think about. 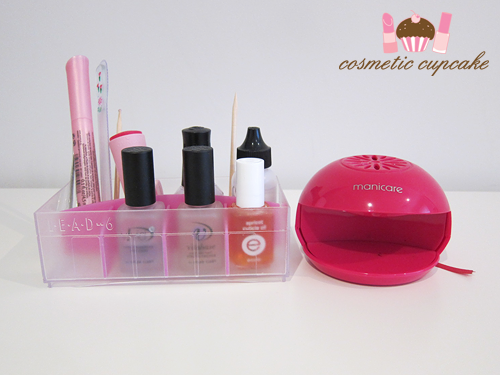 I hope I gave you some ideas on how to store your nail stuff and that you enjoyed this post! How do you store your nail stuff? Wow. you really do have a huge collection! 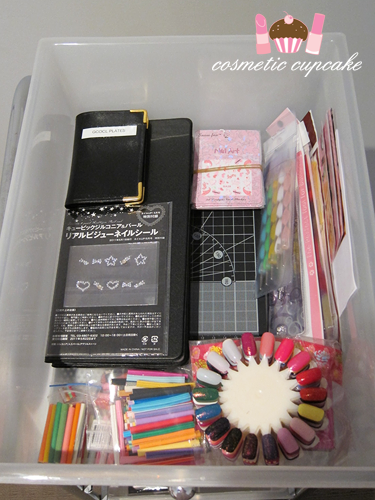 Im tempted to organise my tiny stash.. but its so hard to find containers that'll fit some of the things~!! WOW! Love this post! You have an amazing collection! So jealous! I'd love some polishes from different parts of the world! I also use a helmer! It stores all my nail art supplies and my polish, but I also have a polish rack on top of my helmer which holds my favourite brands. Great stash organization! In a few weeks I'll be posting pics of my stash and storage too, I really find it interesting to see how different ideas people have for the same thing, gives me ideas for mine too :) Thanks for sharing! Wow...it's so well organised!!! Absolutely amazing collection you have there next to your bed ^^ I like to keep my little collection in boxes with nice designs. WOW, what a crazy collection you have!!!! Oh my gosh...it's all so cute! 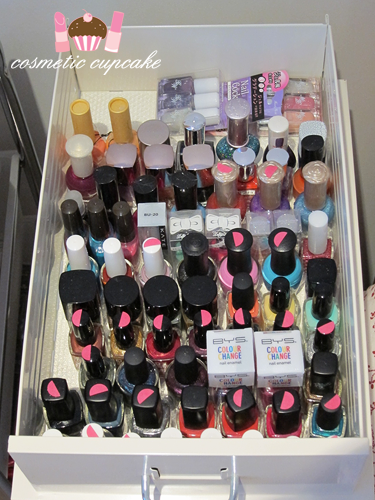 I have nail polish envy (: Great collection. Great storage, you have quite a collection! 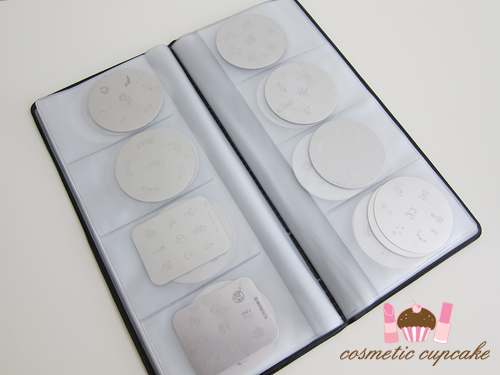 What a GREAT idea to use business card holders to store your stamping plates. Thanks for sharing! I wish you would post more often! I love love love love love your nail art! wow amazing storage and stash :) just a teeny bit jealous lol! :D I love your stash. It looks so much more organized than mine! @C: LOL no you aren't being stalkerish at all! Thank you for taking the time to comment on my blog - I appreciate it more than you know hun!! =D I'm a neat freak and I have to have things just so, hence my neat storage hehe. @Jen: Yeah but can you believe I still feel the need to expand my collection??! When I started my collection I used plastic containers from Kmart (see my August 2010 storage post to see what they look like) and they worked really well. You can find something like them in dollar stores and hardware stores too. @Monika: Yeah.. 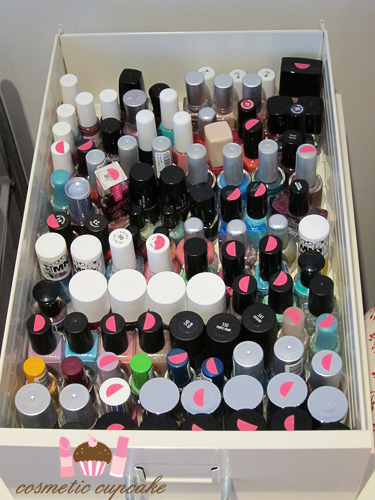 I got a little carried away buying/swapping polishes as you can see o_O Glad you like the idea! It took me forever and everywhere to find a good solution. @Olivia: I'm so very blessed to have made such wonderful blogging friends who have been willing to swap and gift polishes to me. It's always exciting trying new polishes from around the globe! @Amy: I'm glad you enjoy these posts too Amy! I loooooove storage so I brainstorm ideas on how best to store my stuff all the time haha. @Celina: I'm just a neat freak and have to have things "just so" xp No worries hun! @Christine: I have suffered denting to a new manicure WAY too many times so I keep everything on hand. It works trust me! @Erika: Thank you Erika! That's exactly why I love storage posts too. There's always great new ideas to adopt! Good luck with your storage =) I hope to see pics when it's done! @Kayleigh: I can't stand mess as it just doesn't give me the right "vibe" to paint my nails which is why everything has to be neat! I'm OCD lol. 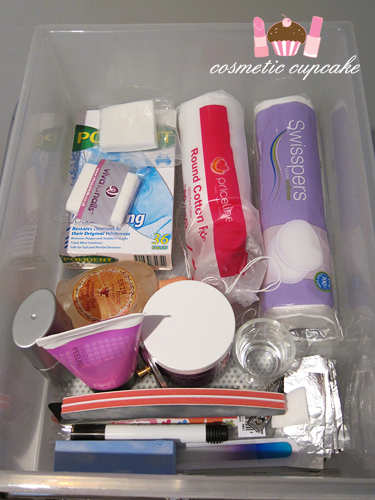 @Crystal Luvz: LOL my stash is modest compared to other bloggers who have something like 5+ helmers! @Heather: Hehe thanks Heather. My polish collection is like my baby!! @Jessica: LOL it's not for sale unfortunately!! Glad you like my organisation Jessica ;) It drove me mad when I didn't have my helmer set up the way it is now! @PaO*: Glad you like my post! @JC ♔: I never thought I'd get to this point with my collection. It's kinda getting out of hand!! @Christine Iversen: Storage of beauty stuff is such a labour of love I find. I'm always moving things around etc. You'll find your happy organisation system soon enough! @Beauty Soiree: Awwww thank you for your sweet words! I wish I had more time for nail art but unfortunately real life gets in the way sometimes. I'm glad you like my storage hun! @Elisa ♥: LOL mine isn't big compared to other nail bloggers who have like 5 helmers!! Gosh I would love 5 lol. GREAT collection and fabulous storage. You are super organized! Business card holders! I should definitely try that! 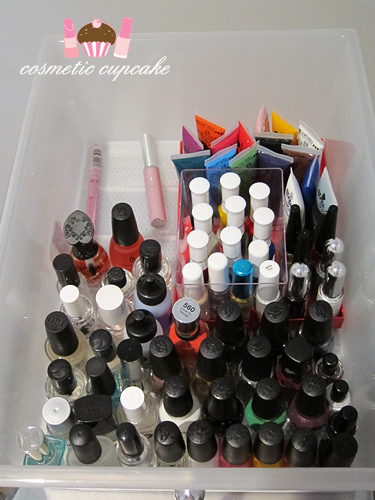 I am so jealous of all of your nail polish and nail art supplies, I wish I had more! I keep my nail stuff in a helmer but I also keep my makeup in it too so I'm running out of space. 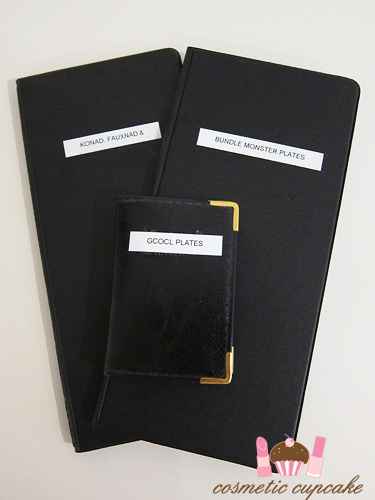 And I totally need to get some business card holders for my stamping plates! ooo :) that's enchanting! I'd like to have a collection like your! Hello! I don't think it's listed here but where did you get your nail drier? I'm looking for a small portable one and that one looks perfect! Does it work very well?